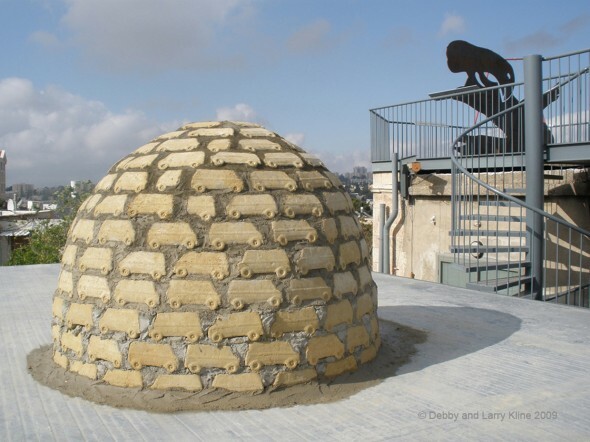 Built atop the Museum on the Seam over the Passover and Easter holidays, Earth Igloo for Jerusalem reflects its surroundings, a dome in a city of domes, and is an ironic mud structure in a future sans ice. The mud is from the region of the Dead Sea, a body of water that is dropping an astounding meter per year! The Jordan River, the source of the Dead Sea’s fresh water, has slowed to a trickle as it is siphoned off to provide drinking water for Israel, Jordan and The Palestinian Authority. While many believe that the next wars will be fought over water, Jordan and Israel are now meeting to solve their joint water issues associated with the Dead Sea. This project uses mud brick building techniques, one of the earliest visible signs of human exploitation and manipulation of the environment, to address human impact. The process is an ancient one, using natural clays and sand combined with straw for tensile strength. The molds used to form the bricks are somewhat more contemporary, using plaster forms to create likenesses of 1970s model gas-guzzling vans. These vehicles, once symbols of freedom and American affluence, are now icons of waste. Using their likeness in this context mirrors the inevitable return of obsolete technology to the earth. The Museum on the Seam is housed in a former Israeli guard station which once protected the volatile border between Israel and Jordan. Its battle scars are still visible. Fortunately the only politics that we encountered were associated with the acquisition of special mud, which is protected by the government. A Hebrew University archaeologist who assisted us admitted to once being arrested while digging the clay from a hillside. However, the museum found a cob builder/park ranger with the proper permits to collect the mud necessary for the project. 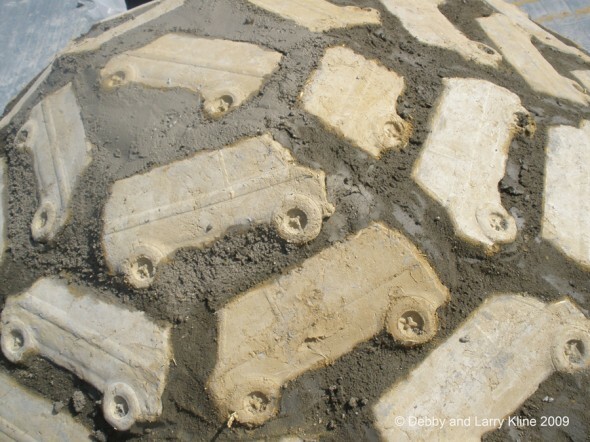 A sister igloo will be made from mud near the Salton Sea in the United States. This inland sea is also in crisis due to pollution and evaporation.